It has been known for a long time that the British Government Communications Headquarters (GCHQ) has been intercepting millions of Russian telephone calls, SMS texts and internet traffic, along with the communications of other target nationals, including Americans and the British themselves. Older eavesdropping operations, such as ECHELON, have been documented by European Parliament investigations. More recent operations, such as PRISM and TEMPORA, have been confirmed by the former National Security Agency (NSA) contract agent, Edward Snowden, whose disclosures substantiate the methodology of surveillance, the range of data produced, targeting, sorting, and purported value. ECHELON snooped on satellite traffic; PRISM on internet data from server companies; and TEMPORA, a telephone surveillance operation, tapped international fibre-optic cables. The signal collection stations are in all sorts of places, including the US, Puerto Rico, Cyprus, Japan, Germany, Canada, UK, and Australia. The Snowden material is up to two years old; the operations he has documented date from about 2007. The Russian services, including FAPSI (the Federal Agency of Government Communications and Information), do much the same thing. The European Parliament report of July 2001 concluded: “Together with the stations available in Russia itself, global coverage is theoretically possible. However, here too, the information available is insufficient to draw any firm conclusions.” About China’s capabilities, the now 12-year old report knew even less. So far Snowden has revealed nothing of novelty about Russia, although President Vladimir Putin’s spokesman implied earlier this month that he may know something of value yet to be disclosed about the Anglo-American targeting of Russian business, banking and military operations. Whether there will have been time for Snowden to discuss that on board Aeroflot, during his Sunday and Monday flights, or overnight in Moscow, is a secret that isn’t likely to leak. The Guardian has published excerpts of a presentation showing a colour-coded map of the world indicating which countries are least to most heavily targeted by the surveillance and interception programme called BOUNDLESS INFORMANT. The date of the map is March 2013. Top of the pops (red) are Iran, Pakistan, Jordan, Egypt and India. The US and China are comparably coded orange. Russia appears to be between yellow and green. This still means that a lot of what the Guardian refers to as entirely innocent Russians are under foreign surveillance. The Guardian refuses to reveal the volume of data interceptions reported for Russia, compared to the other countries on the map. The colour coding suggests that Russia is less intensively monitored by GCHQ and NSA than the US itself. But this measure is an outcome of Snowden’s selection of what to take and what to leak, so far. There is no telling what Snowden and the Guardian are holding back; nor what other GCHQ and NSA programmes have been designed to analyse Russia and Russians. According to the unclassified paper describing Boundless Informant, “the tool allows users to select a country on the map and view the metadata volume and select details about the collection against that country. The tool also allows users to view high level metrics by organization and then drill down to a more actionable level – down to the program and cover term.” Metadata include identification of sender and receiver, time, date, channel, and duration of communication. The actionable level is what exactly is said, written, messaged. Before the Snowden materials were released, there was evidence of how those programmes work; that is, after the targets have been registered, communication channels identified, intercepts extracted from the database, texts logged, and alerts despatched by low-level analysts to their supervisors and action managers. If you are Russian national Oleg Deripaska, for example, here are your rights, according to the NSA targeting procedures. And if you are a US citizen like John Helmer, here are the NSA guidelines. If in this hypothetical example, Deripaska were talking about what was to be done to Helmer in conversation with a Russian lawyer, or with a US or UK lawyer working for Deripaska – pull the other leg! — the monitoring may have to stop. Section 4 of the NSA targeting procedures refers to attorney-client privilege blocking such surveillance for people under criminal indictment in the US. It isn’t clear what attorney-client privilege might apply to foreign nationals who are under investigation by the Federal Bureau of Investigation (FBI), but not under indictment. 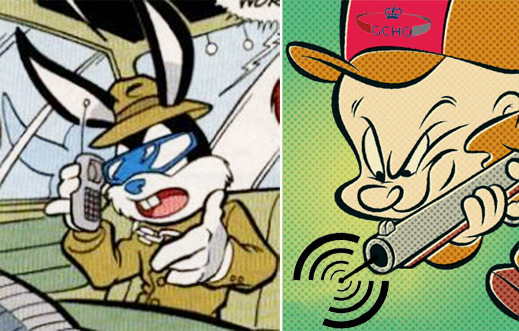 According to the Snowden disclosures and subsequent reporting in the UK, if the GCHQ is the agency which monitored the hypothetical call, it wouldn’t be restricted by the US rules, and it could store and share the information with other intelligence agencies, including the US. At least, these were the NSA procedural guidelines when US Attorney-General Eric Holder signed them on July 28, 2009. They may be different now. Also, GCHQ and the Australian government, one of those permitted under section 8, may have different rules. That Deripaska has been a target of Anglo-American interest, FBI investigation and intelligence analysis has been known for a long time. Deripaska admitted this in Rusal’s December 2009 prospectus for the initial public offering (IPO) on the Hong Kong Stock Exchange, adding his explicit denial that he was then under criminal investigation in the US. Most recently, Deripaska was in New York City and then Washington, DC, for meetings on Friday and Saturday, May 31 and June 1. The special visa arrangements have been reported here. That Deripaska and Rusal have been a target of the GCHQ and NSA surveillance operations is a likelihood; the official answer is classified; Snowden may not know it. But the Snowden materials help elucidate how records by one agency on one side of the Atlantic are shared by intelligence analysts on the other side, as well as in other countries. That there was at least one telephone intercept operation, the record of which made its way through the analysis and dissemination process, is certain because it was logged by the Australian Government in December 2009 and then investigated by the Federal Security Service (FSB) and Moscow police. That’s the story of Rusal’s plan of attack against Helmer, revealed in detail after the Moscow police had arrested three gunmen, seized documentary evidence and weapons they were carrying, and obtained their admissions under interrogation. 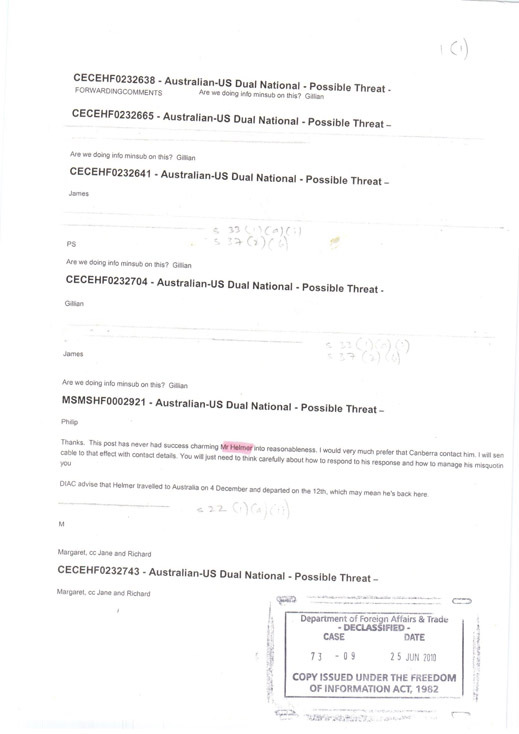 The pencilled notations following the blanks and the redacted text, refer to sections of Australia’s Freedom of Information Act, which permit keeping the secrets from disclosure. 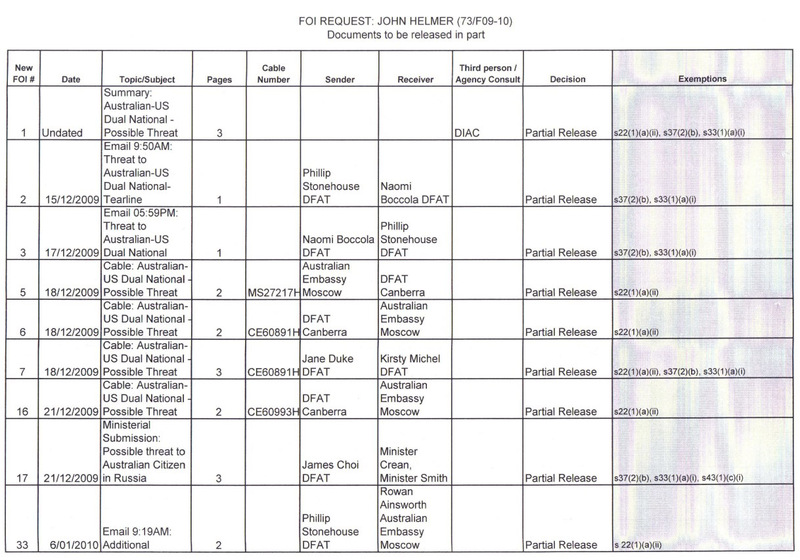 And here is the track of how the intercept report was processed by Australian officials before they issued their Russian security warning. The references in the exemptions column refer to sections of the statute which help pinpoint the Russian names in each of the documents. As the Guardian has reported in relation to the Snowden materials, the GCHQ and the NSA wiretaps and internet records are between entirely innocent people, as well as targeted suspects. This is no less true of Russians, as of other nationals. Whenever Deripaska is asked about what was uncovered in Canberra and Moscow in December 2009, he or his lawyers respond that he is entirely innocent.